When visiting Chobe National Park, that sits where four countries meet, you may end up crossing several borders and learn what an African border-post is all about.. 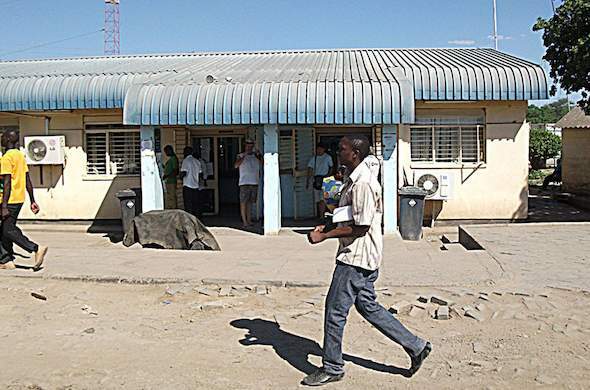 Above: Kazangula border control between Botswana, Namibia, Zambia and Zimbabwe. Many tourists combine a visit to the Victoria Falls with a trip into the Chobe National Park. This is considered to be one of Africa's greatest wildlife destinations and is famous for the number of Elephants that occur there. What many people do not realise is that the Chobe National Park is on the borders of four countries which meet about 40km up from the Victoria Falls, and depending where you go in the region, you will have to cross these international borders. On a recent trip in the Chobe region I learnt just how many stamps you can get in your passport in a very short period of time! We had flown into Livingstone in Zambia and completed immigration at the airport. We were now in Zambia having left South Africa; we had one stamp in our passports. Most of us were from South Africa, which made the border process very easy, as there are no visa fees but we acquired another stamp with official force - whamp! People from many countries will have to purchase their visa upon entry into Zambia.We then travelled about 9km and crossed the border into Zimbabwe. Upon exiting Zambia which we had entered minutes earlier we were duly stamped out again. This border is a typical African border post with big trucks waiting to cross, and people walking across the Victoria Falls Bridge into Zimbabwe. You can walk, but it is not or the unfit, as it is about a kilometre, and often has to be done in 40 degree Celsius heat. We crossed in our blissfully air-conditioned vehicle and arrived at the Zimbabwe border post. Here we had to wait in line for about twenty minutes as there was a large tour group purchasing visas in front of us. This border can take anything from one minute to half an hour depending how many people there are. Finally we had another stamp in our passport and we were in Zimbabwe. We had spent an afternoon taking in the mighty Victoria Falls, before heading to our accommodation at Imbabala which is in Zimbabwe up near the Kazungula border. The Botswana border is about a 40 minute drive away from Victoria Falls on a good tar road. We had a blissful night in camp, and the next morning we were up early to transfer to Botswana. We left Zimbabwe via the Kazungula border and entered Botswana, getting another two stamps in our passports -one to exit Zimbabwe and another to signify entering Botswana. This border post was friendly and efficient and not as busy as the one into Zambia looked. We were using the road entrance to enter the country, though you can also take the ferry or a boat from Zambia.We spent some time in the border town of Kasane in Botswana before we completed immigration at a different set of immigration offices down by the river as we were staying in a lodge on the Namibian side of the Chobe River - Thump went the stamp once more! We then climbed aboard a small motor boat that had a canvass awning to protect us from the fierce midday heat. This was the boat that would take us to Chobe Savanna Lodge in Namibia. First however, we had to complete Namibian immigration. As the official who manned the post just across the river was away, we had to boat down river to the border post at Impalila island. When we docked we realised that the natural harbour was about a 600m walk from the immigration offices. This is because when the Chobe River is in flood all the area would be under water. We were the only people at this border post and were quickly attended to Stamp, Stamp!We then boated all the way up the river to Chobe Savanna Lodge in Namibia. Along the way we saw many herds of Elephants that had come down to quench their thirst. Chobe Savanna Lodge has wonderful near panoramic views across the floodplain to the Chobe Game Reserve. The next morning we were transferring to Chobe Game Lodge which was in Botswana, which meant that we repeated the process. We boated back to Impalila Island. Stamp, then back up-river to the border post where we were duly stamped back into Botswana. Thump! And we were only half way through the trip. However most of the rest of our journey took place in Botswana apart from crossing into Zambia to catch our flight from Livingstone.